No, I don't mean that derogatorily. It really is a marvelous, marvelous tool. How did I get by without a mandoline? Perhaps if I boasted stellar knife skills it wouldn't be so surprising, but alas, my cutlery talents are pretty lacking. Until now, I've just had to make do with thick, uneven slices of various fruits and vegetables. Mammicus Maximus got me a mandoline for Christmas, and I've used it many, many times in the month since. My apple chips are much improved, and my latest endeavor was sweet potato chips. The blade had no trouble slicing up the big orange tater, and the resulting chips were wonderfully-seasoned and perfectly crisp. I may have even sprinkled some cinnamon on a few most of the chips. Slice your tater(s) pretty thinly, either with a mandoline or any fantastic knife skills you may possess. Spray a cookie sheet or two or three with the cooking spray and spread the slices out in a single layer. Spritz the tops of the taters as well, and sprinkle with your seasonings. Bake for 30-35 minutes, turning the chips over about halfway through; season the other side. Depending on the heat dispersion of your oven, you may need to remove some chips before the others are completely done. Also, I noticed that even though I pulled some out when they weren't quite browned (lest they burn to a crisp), they still ended up crunchy and delightful. *Now it's pretty much guaranteed that I draw blood on the next go-round. EEeeeee! That's it. I am bugging everyone I know for a mandoline now. Those chips look so good. And crunchy?! Bless, it has got to be amazing. Ooh, mandolins also look like just plain fun to use. They're on my wish list too. Your chips look and sound delicious... and they're healthy to boot! I just got one a few weeks ago and just love the way it slices potatoes for fried potatoes. Yesterday i was trying to grate apples for the muffins and one of the metal teeth came loose in the apple...baby tooth?? Maybe it'll get big teeth now! Its so perfect for chips! That's a great gift! And, those chips are calling my name. They so crunchy and delish. The chips look yummo too!!! Yeah, you're right you probably just jinxed yourself. Better have the bandaids handy! I've eyed those mandolinesbut couldn't think of a reason why I desperately needed one. Now I have a recipe that calls for it. Yay! Ooh YUM ... I've been coveting a mandoline forever now. Might just have to get one so I can make these! So pleased to hear Grace you got a mandoline - they are good! 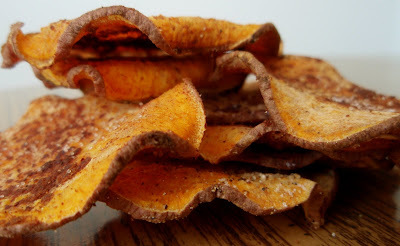 What a great idea Sweet potato chips gosh I need to have a go at making these now, they look wonderful! Those chips look fab! So crispy & crunchy! I love my mandoline. I have been using one for years. I think I got mine on Amazon for about $30. It's lasted 5 yrs now and is still sharp. Great tip for protecting your digits....get a kevlar glove. No more cut fingers!! I want a mandoline so badly! But I'm afraid I'll chop off my fingers. That picture up top, however, just may change my mind. YUM. Oh no you jinxed yorself by saying that you HAVE NOT cut yourself. Salt over the left shoulder should help fix that though. I love those chips, all the more reason to go get one of those tools! Owning a mandoline is a must for the kitchen. The good news is, a cheap one will do. I bought a mandoline, years ago in Montréal Chinatown, and can't live without it. I even take it on trips in my trailer. Love that thing. Great taters. Awesome! Sprinkle on that cinnamon! I'm so glad you haven't hurt yourself on the mandoline--those suckers can be dangerous! Maybe I ought to look into this mandoline thing? I use the slicer blade in my cuisinart food processor. Can't live without the dang thing! We got one for our wedding and we just love it! We made chips too! It makes the slicing so easy and so pretty! Sweet potato chips are my favorite. I will try them with cinnamon next time! YUM! Delicious looking chips! My knife skills are pretty bad as well. Looks like it's time to invest in a mandoline! What brand of mandoline did you get? I've tried a couple and haven't had the best luck. I bought the Cuisinart one for myself and for my mother and we ended up having to return them. They were far too clunky --and risky -- to use. Now I have a $60 OXO one and it's okay, but it's still a little rickety seeming. It comes apart sometimes while you're slicing and it doesn't always give you a nice even slice despite numerous attempts at different techniques. The mandolin is definitely my next kitchen purchase...I borrowed one from my neighbor and fell in love. Your chips look fantastic - love the color. I have been wondering if I SHOULD want a mandoline for a while now or if it was one of those unitaskers Alton Brown is always yelling about. :) I guess I want one. The chips look awesome, btw. Puuhhhlease tell me you knocked on wood when you made that last comment!! Hey we both got one for Christmas from our Moms- too funny. Except I call my Mom, Mamushka. I love the sweet potato chips! I could eat a ton of them, not good. I recently received one of those myself from ol' hubby; didn't know what to make with it! I loooove the idea of these chips...and cinnamon, yum yum! How did you live without it? How? These are beautiful..very potato ho-ish. The chips look scrumptious! The mandolin is a great stress release! 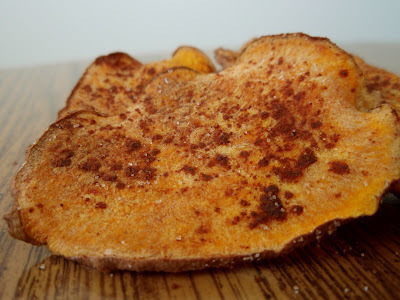 Baked sweet potato chips sound great and the cinnamon just takes them way over the edge! I especially like that they're crispy. I'd way sooner eat a sweet potato chip than any other chip. Every time I pull my mandolin out to use it, I wonder why I don't use it more often. Those taters look yummy! These look so good. I have two mandolines now, a big expensive french one that I never use because it's a pain to clean, and a little handheld slicer that I've been using all the time. Lets start with saying congrats on not cutting yourself...yet. You are simply just a kick in the head (that is a good thing)I really enjoy your blog so much, your tater chips look fabulous. Yes, isn't a mandoline the best? I don't think I would have ever attempted Sweet Potato Chips without them and Sweet Potato Chips turned out to be one of the very best things I've tried in a long time! I had mine with Cranberry Salsa and they was amazing, Sprinkled with cinnamon they are probably only better. i've never made chips before, and that's probably largly due to the face that i don't have a mandoline or any knife skills!! now i must run out and get myself a mandoline so i can make these deeeelicious chips! they look so good, for something that wasn't deep fried in a vat of oil! how'd you get them so crispy looking?! Hey...I received a mandolin for Christmas too. Isn't it great when people understand our needs and give foodie realted gifts. Perfect!! I wish I was as lucky as you, receiving a mandoline for Christmas. I have something that comes close but it doesn't slice very thin though. Dare I say I gifted my mandoline to another cook ? Love the chips! How fun! A mandoline is high on my list of new kitchen gadgets I hope to obtain soon. Love the sweet potato chips - they look yummy! These look wonderful, Grace! I've often wondered if sweet potatoes would be tasty as a chip. What kind of mandoline do you use? The one I have does not slice a sweet potato very well, so I'm curious. I love mine as well but we never use it. Im hoping we will start to this summer but I normally just stick to the knife. mmmm. i have only had sweet potato chips once, but they were delicious! yours look so yummy. and i'm so jealous of your mandoline. i've been asking for one a lot lately! it's falling on deaf ears, though. What kind did you get? I need to replace my cheap clunky one. Mandoline's are awesome! I've never had a cinnamon sweet potato chip. They sound so good, and I bet they smell terrific, too. Boy oh boy, you've got a lot of patience to hand turn each chip half way through baking! Mandolines are amazing providing consistent results, meaning more even cooking and just a more professional look. I can say they are dangerous. Don't try to cut hard cheese slices with this. I have a big scar from about 3 years ago. That said, stupid to cut hard cheese on mandolines. Look at those potaterrrrrrr chip, waaa I can eat all of them. Oh baby the chips look great. And you even put cinnamon on them! I don't own a mandoline. Or a microplane :( Whaaaa! These look too divine, and I'm still drooling over the idea of apple chips. Yum yum yum. Ooh, what a tool indeed. I love my mandoline. Good chips! I really must get mine out more often, these look fantastic! MMM, chips...I have such a weakness for chips. I like the cinnamon sprinkle. Oh wow time for me to break out that mandolin and make some of those taters! Oh no, a mandolin would be a bad thing for me. Endless amounts of homemade potato chips! ...hmm, maybe I should reconsider the thought. Awesome sweet potato cinnamon chips! Ohhh, now I want one... a mandoline AND a chip!! Those look wonderful!! The sweet potatoes are a good choice. Yes, I love me my mandoline, too, and need some of those taters. Haven't tried sweet taters, yet, nor round chips which is a good excuse as any to get out the contraption. And count yourself lucky that you haven't sliced yourself because it's mighty messy. Like stuck pig messy. I could not live without my mandoline. Slices everything perfectly and has a myraid of uses. That's a marvelous tool! And perfect chips! Mandolin...added to list of kitchen products I NEEEED to survive. I've got a cinnamon post for you...it'll be up tomorrow. Nothing like last minute, eh? Sad to say that I have no such knife skills. Mandolines make it seem like I'm a culinary god or something. Thanks for the Mandolines chips recipe. I am also planning for a detox session next month and its foods that I am worried about. I am definitely going to try Mandolines chips during that time.The Photos are amazing... I am already feeling hungry.Can't wait to try it. I made these chips this week and posted a link to your recipe on my blog. They were yummy! Thanks! I tried this earlier this month. Yum! So simple and good (even though I was dumb and burned mine because I didn't follow directions carefully). Thanks!